Did I forget to mention potato salad? There was always potato salad on Mamaw’s table. That perfect combination of creamy, crunchy, tangy, salty, starchy and yummy, makes it impossible for anybody else to hold up a candlestick. 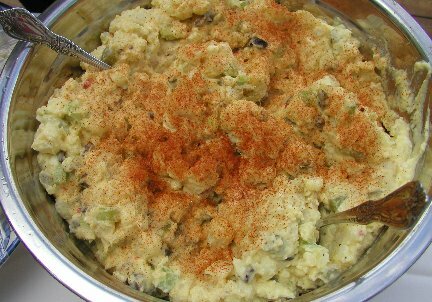 Now, I have made Mamaw’s tater salad and so has my mom, my sister, my cousins, and my daughter and we all fall short of the glory of Mamaw’s. But still we try. Peel skin off while warm. Cut in cubes and salt and pepper (while still warm). Where are the proportions, you may ask? Sadly, I must say, here in lies the question, the problem, the challenge, the opportunity and the mystery that ensures Mamaw’s supremacy. Lots of luck! Yum. Keep these coming! PJ’s been asking me to learn your family recipes for quite some time.